Shipping a Car From Philadelphia, PA to Las Vegas, NV? Las Vegas, also known as the city that never sleeps, is located in Nevada’s Mojave Desert. This city has a lively nightlife and casinos that are open 24 hours a day. The main focus of the city is the Strip, which is a little over 4 miles long. 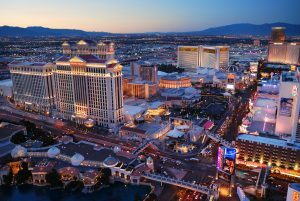 Many consider Las Vegas to be the entertainment capital of the world. The strip is packed full of beautiful hotels with replicas of many famous landmarks from around the world. Las Vegas is known for gambling, shopping, and fine dining. Vegas, as many people call it, is also the leading financial center for Southern Nevada. That is one of the reasons people move here. If you are relocating from Philadelphia, PA to Las Vegas, NV, we will be happy to help you with auto shipping! Want to Ship Your Car from Philadelphia, PA to Las Vegas? From Philadelphia to Vegas is about a 36-hour drive — and that’s non-stop. You will also need to add in time to rest. It may take several days to drive between these two cities. You will have to pay for food, gas, and hotel accommodations. When you consider all the expenses and the stress of driving, shipping your car starts to look like the easier option. At Philadelphia Car Transport we do everything to make your car shipping process easy and hassle-free. Whether you ship using open car transport or enclosed auto transport, we make sure our service meets your expectations. At Philadelphia Car Transport our agents are here to help you make your car shipping process easy and worry-free. We will deliver your car from point A to point B safely and securely. We make the whole process go smoothly. Visiting our page will explain everything you need to know about how the car transport process works. Get your free quote today on our website or give our office a call and one of our wonderful agents will love to assist you with any questions you may have. We would love to help make your car transportation process hassle-free.